So what does Cary do for an encore? How about creating a stellar sophomore effort that builds upon the debut’s many charms? I’m Staying Out stands out as a superb example of uniquely Southern pop. Rock, country, soul and folk smoothly blend together with Cary’s gorgeous vocals serving as the unifying force. And what a force her voice is: majestic and melancholic, honey and hickory, Caitlin’s singing is like a comforting shoulder to the brokenhearted, easing them through love’s tough times. Given her accomplishments, it’s somewhat surprising that a musical career wasn’t something Cary dreamt about growing up in the small northern Ohio town of Seville. She imagined that she might become a writer or perhaps a veterinarian. Music, however, played a major role in the Cary household. Her parents share a love of singing and her dad even built instruments. All of her six older brothers are musically inclined, with her brother Peter being one of her early musical inspirations. As a young child, Cary actually wrote songs that she “performed” on her dad’s homemade harpsichord. When she was around six, she started studying the violin, which she played for a decade. That sense of unreality has dissipated as Cary has ventured out on her own and found her music striking a responsive chord with music fans, critics and fellow performers. Cary finds it very “flattering that so many people really seemed to like the (first) record.” One person who really enjoyed the album was country music star Mary Chapin Carpenter; Cary got a note on her fanmail web site from Carpenter stating that she liked While You Weren’t Looking so much that she bought 20 copies to give to her friends. Cary and Carpenter subsequently struck up a friendship, and when Cary performed in Charlottesville, Virginia, the two sang together on “Pony,” Carpenter’s favorite tune off the disc. Two longtime Team Cary members — Chris Stamey and Mike Daly — play crucial roles on I’m Staying Out. Stamey, who helmed Cary’s 2002 debut as well as her earlier EP Waltzie, reprises his producer duties. “Chris and I know how each other works,” Cary says. “So it felt really good to go back and work with him as a more confident musician, songwriter and band leader.” Daly first worked with Cary during their time together in Whiskeytown when they would sneak to the back of the tour bus and write songs, and he has remained a valued collaborator. Cary, who hasn’t yet “conquered learning how to play guitar,” relies on “somebody who’s willing to sit there and work out the chords with me.” Because this album had such a short recording schedule — three months versus the debut’s two year gestation period — there was a “mad scrabble” to get songs ready. Cary engaged in a “whirlwind songwriting session” with Daly that resulted in the robustly soulful “You Don’t Have To Hide” and “Cello Girl,” the disc’s hardest rocking song. He also penned “Sleepin’ In On Sunday” (a wonderful tune Cary correctly calls “a perfect little gem”) especially for her. 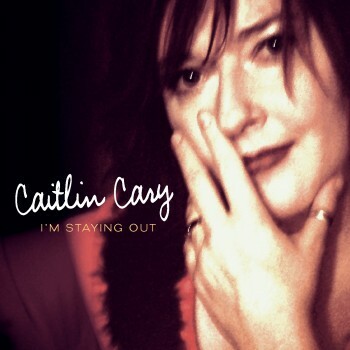 One subtle, but significant, difference on I’m Staying Out is that Cary’s touring band –keyboardist Jen Gunderman, guitarists Brian Dennis and Dave Bartholomew and drummer Jon Wurster — serves as the disc’s core studio band. “It was a delight to go in and make this record with people that I’ve been playing with,” Cary confides. “We didn’t have to define the entire thing from the ground up like on the first record. I already knew who I was; I knew what kind of songs I wrote, and I had the experience of having performed live with the band and that plays a notable role in how the new disc has turned out. We enjoyed rocking people and there’s an energy that comes from entertaining a crowd that I didn’t really know that I had until I tried this.” The band, while on tour, also got to road-test several tunes — the tender soul-searching “Beauty Fades Away”, the heart-aching “Empty Rooms” and the searing character study “Lorraine Today” — before committing them to disc. I’m Staying Out brims with a confidence that comes not only from a musician who has a solo album and tour experiences under her belt, but also from an artist fully discovering her talents and place in the music world. “It’s incredible,” Cary reveals, “feeling as though you’re entering this community that you’ve been lurking around the doors of for so long.” This confidence manifests itself in the disc’s arrangements (Cary here paints from a wider musical palette, ranging from the feisty rocker “Cello Girl” to the old school Nashville-sounding “Please Break My Heart”) as well as in the lyrics. Where While You Weren’t Looking was filled with songs about lost or misguided people, I’m Staying Out is populated with women who are strong and resilient in the face of life’s hard breaks. Cary recently dreamt that Mary Chapin Carpenter called her about a Lovett/Carpenter/Cary tour. While a younger Caitlin Cary might have seen this dream as just a fantasy, she now considers it as “a dream that I’d like to come true — it could come true.” Her present tour plans, however, revolve around hitting the road in support of I’m Staying Out, reconnecting with old fans, making new ones, and even reuniting with long lost friends. At a Baltimore tour stop last year, she had a great time meeting up with an old buddy from the Garden Weasels. When she’s off the road, Cary greatly values her time at home in Raleigh with her husband (and former Whiskeytown drummer) Skillet Gilmore and their two dogs. Read an interview with Chris Stamey on Huffington Post.